We saw a need for quality leather work gloves in child sizes. Its hard to find a good kids leather work glove at your local store in the appropriate sizing. If any are offered they are usually cheap cloth or cloth/split leather combo. Now we offer the same top grain leather gloves for your children like you would enjoy wearing yourself. Top Grain Leather Gloves conform to your hand and last without being too bulky. 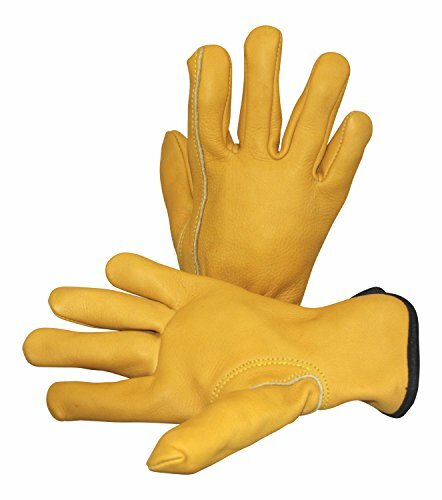 Whether your kids want to work in the yard, ride a horse, bike or atv, help on the farm or ranch, rodeo, build, rope, garden, camp, or hunt, our gloves will provide stylish long wearing protection for outdoor living. L Keystone thumb provides room for movement Double stitched for durability. Elastic on wrist. leather tested for Lead, PH value, and Chrome content What is top grain leather. It is the outside part of the leather. The part of the hide under the hair. Split leather (suede) is the underneath layer when the split the hide into two or three parts.. depending on how thick the hide is. So top grain has the smooth side on one side.. The other side is like suede. Of course topgrain has the original look and grain of the leather. It is the premium part of the hide. Top grain leather is more flexible, soft, withstands moisture and takes leather conditioner and better looking then suede leather. Look no further for leather gloves for kids. Sizing hint: If your kids 8 year old has large hands, then size up to Large.. Its better to big then too small for growing workers. Of course a small handed 12 year old will be able to size down.. 4 sizes give an advantage for fitting your child. Our kids love to wear these quality gloves when they are doing outdoor activities. We use them for dog grooming, weeding, hauling wood, feeding hay, fencing, riding 4 wheelers,.They fit our western lifestyle. We make durable gloves that will last and back it up with a 30 DAY WARRANTY against wearing out with normal wear. We will replace your tough gloves if they wear out in that time. Of course we won't cover if you put them on the sander or something.. If you have any questions about this product by Suse's Kinder, contact us by completing and submitting the form below. If you are looking for a specif part number, please include it with your message.